Two exciting domestic match-ups have been confirmed for the undercard of Billy Joe Saunders’ WBO Middleweight World Title defence against Martin Murray at The O2 on June 23. Heavyweight sensation Daniel Dubois (7-0, 7 KO’s) takes on Hatfield’s Tom Little (10-5, 3 KO’s) for the Vacant English Heavyweight Championship and undefeated Guisborough Super-Lightweight talent Josh Leather (13-0, 6 KO’s) squares off with highly-ranked Hackney man Ohara Davies (16-1, 13 KO’s). Dubois will be aiming to continue his seven fight KO streak when he fights at The O2 for the first time next month. Little is looking to return to winning ways after a loss against Hungarian 2016 Olympic bronze medallist Filip Hrgovic. “I’m looking forward to fighting in my hometown of Greenwich on June 23rd,” said Dubois. “Tom is another step up in level for me on my journey to the top of the Heavyweight division. I’m determined to add the English belt to my collection in front of my home crowd. “I’m delighted to get the opportunity to stop the hype machine in its tracks,” said Little. “This is a fight that I truly believe I will win. I’m not taking anything away from Daniel, he’s very talented but I’ve seen gaps in his armour and things that I can exploit, he’s tailor made for me! Leather was last in action in a 12-round war against local rival Glenn Foot and the Metro Radio Arena Newcastle in November, edging a close points win to keep hold of his IBF European belt. Davies has been out of the ring since his explosive sixth-round stoppage win over Tom Farrell in September and is set to make his return against Christopher Sebire at Elland Road on May 19th. 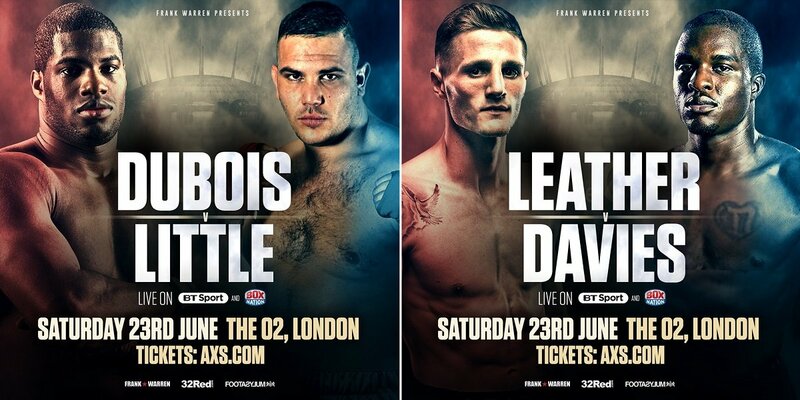 Dubois v Little and Leather v Davies are part of a huge night of boxing at The O2 on June 23rd. An unmissable card also features rising Light-Heavyweight star Anthony ‘The Beast’ Yarde; Darryll Williams defending his English Super-Middleweight title against Lennox Clarke and Erith Featherweight Lewis Pettitt taking on Birmingham’s undefeated Raza Hamza over eight rounds. Peckham Welterweight Johnny Garton, Southampton Featherweight Ryan Garner, Welling Super-Featherweight Archie Sharp; Ilford Super-Middleweight Umar Sadiq; Chigwell Flyweight Harvey Horn and Erith Flyweight Jake Pettitt complete a stacked card with the professional debut of Hainult Cruiserweight James Branch.